Will the early start be good for the campaign? With the presidential election still more than a year away, the campaign for the White House is well under way with 15 declared candidates and a dozen other potential contenders. The early start is due in part to the so-called “front-loading” of party primaries and caucuses in early 2008 — dramatized by California's decision to move the presidential primary in the nation's biggest state to Feb. 5, nine months before the Nov. 4 balloting. With more states voting earlier, candidates have to move sooner to gain public support and raise funds. Critics fear the longer schedule tires candidates and voters alike and increases instead of decreases the importance of campaign fundraising. In both parties, the contests for the nomination appear wide open at this early stage. But with Sens. 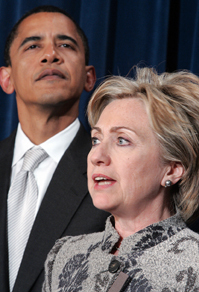 Hillary Rodham Clinton and Barack Obama leading the Democratic field, the race inevitably poses the question of whether voters are ready to elect a woman or an African-American to the nation's highest office.